Alternative polyadenylation is a cellular mechanism that generates mRNA isoforms differing in their 3′ untranslated regions (3′ UTRs). Changes in polyadenylation site usage have been described upon induction of proliferation in resting cells, but the underlying mechanism and functional significance of this phenomenon remain largely unknown. To understand the functional consequences of shortened 3′ UTR isoforms in a physiological setting, we used 3′ end sequencing and quantitative mass spectrometry to determine polyadenylation site usage, mRNA and protein levels in murine and human naive and activated T cells. Although 3′ UTR shortening in proliferating cells is conserved between human and mouse, orthologous genes do not exhibit similar expression of alternative 3′ UTR isoforms. We generally find that 3′ UTR shortening is not accompanied by a corresponding change in mRNA and protein levels. 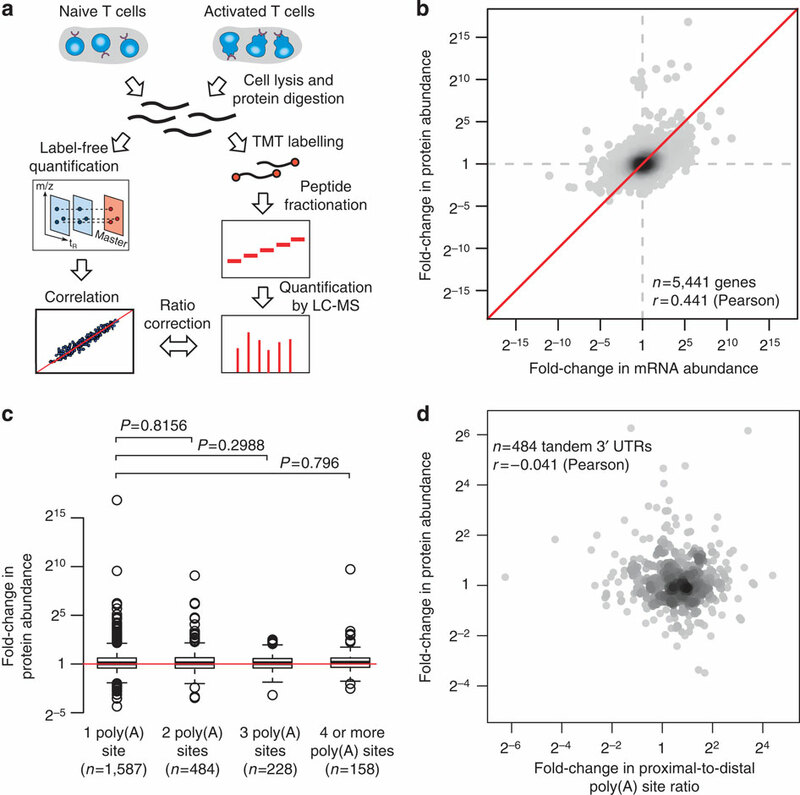 This suggests that although 3′ UTR shortening may lead to changes in the RNA-binding protein interactome, it has limited effects on protein output.